DHL CIS is the largest employee engagement programme in the world. It is recognised within DPDHL as being responsible for the business turnaround in DHL Express from a €2.2b loss in 2008 to a €1.7b ebit in 2017. Now expanded to include each and every division of DPDHL Globally; touching over 500,000 employees in over 220 countries and territories, CIS is a cornerstone of management communication and of employee engagement. In an ever more mobile world, traditional communication and teaching methodologies and channels no longer meet the requirements of either employees or management. CIS set themselves the challenge to engage the entire DPDHL organization and to retain that engagement. How? Well, by ensuring communicated content remains fresh, fun and interactive, that delivery channels are innovative and evolving with technology, that trainers are of the highest quality and that the operational management of the entire CIS programme is intuitive and efficient. IndigoMultimedia is proud to be the technology partner of CIS and to perform a number of key enabling roles within the programme. CIS won the best commercial programme and best engagement and learning programme at the 2012 Training Journal Awards. 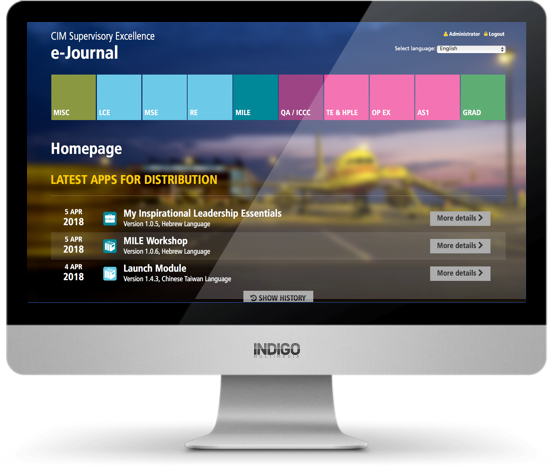 IndigoMultimedia has transformed classroom training materials to deliver a stimulating learning experience in traditional and self-learning environments. Bringing the learning experience to the fingertips of employees, through the use of tablets with on-line and off-line operability allows interactive learning at a ‘when’ and ‘where’ to suit everybody. All of this translated into 42 languages to match DHL’s global audience. We enhance learning by incorporating an innovative range of games and user activities within the learning journey. Sustainability is critical to the longevity. As the technology partner of CIS, we deliver white papers and work closely with DHL management teams to create visions of the future and to support the evolution of the programme. © 2018 INDIGO Multimedia s.r.o. All Rights Reserved. Web created & supported by iNDiGOmultimedia s.r.o.